As teased yesterday, the Transformers Collectors Club have made a full 22 page comic available online, for free. Transformers Timelines #9 stars the characters of the third year of the figure subscription service, and it also wraps up the plot threads that have been left hanging at the end of the Botcon 2013 Machine Wars: Termination comic. Head on over to the Transformers Collectors Club homepage to check it out! Attached to this story - the "clean" artwork for the comic cover by Matt Frank and Thomas Deer (the same team that brought you Spotlight: Trailcutter)! Amazon has posted the cover art to the Transformers Classics Volume 8 trade paperback. This edition which collects the Universe profile books along with the original G.I. Joe and Transformers crossover sports Ironhide on the cover! It's out in March 2015 - check out the listing at Amazon here. Pre-registration for the Transformers: Legends team event Autobot Run is now live. The event will start in 5 hours time and will end on September 30, 2014. "After Spike raises the suggestion that the Autobots could put on a charity race, Silverstreak and Trailbreaker talk their comrades into it. They begin the race unaware that the Constructicons have created a Transfixatron, and during the race, the device is used on the unsuspecting Autobots. The Decepticons soon reveal themselves, and it's then that the Autobots discover they're unable to transform to robot mode." We have also noticed that Gold/Silver Medals are now removed from the Point Rewards. 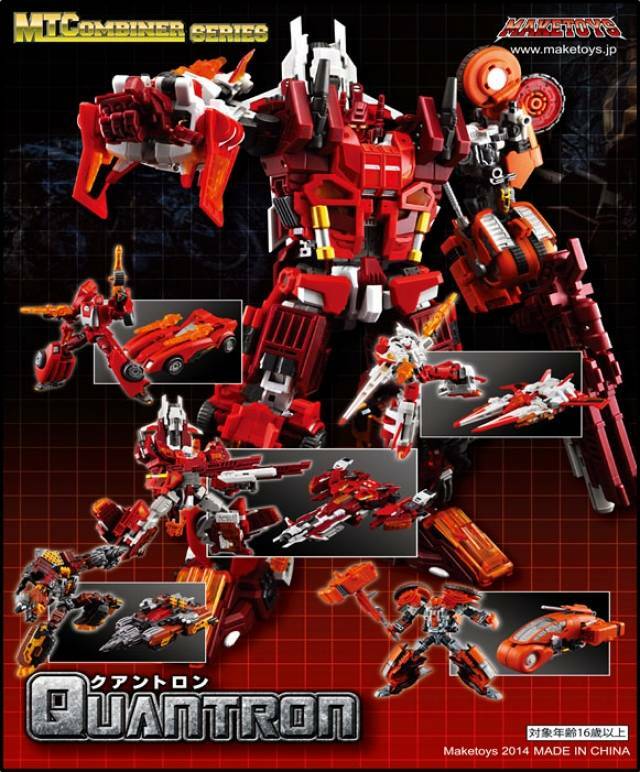 Thanks to Planet Iacon's Facebook we have new official images of Cloud Roadbuster! Cloud Roadbuster is an homage to Superlink Roadbuster aka Energon Ironhide using the Generations Roadbuster mold. Be sure to check back with several TFW2005's sponsors for preorders in the next several weeks. Check out the images after the jump and join the discussion on the forums. Transformers Collector's Club Announces Timelines #9 as a Free Exclusive Digital Comic! The great war is over! Here stand ... the victors?!? The Transformers Collector's Club continues its reveals today, coming off of the earlier reveal of the TFSS 3.0 G2 Starscream. We didn't see this coming though, as the TCC announced a Collector's Club exclusive digital comic set to release tomorrow exclusively on Transformersclub.com, for free! Timelines issue #9 will be a full 22 page story taking place directly after the Timelines #8 issue (Machine Wars: Termination) spotlighting the entire lineup of the Subscription Service 3.0 characters! The creative team of Timelines #8 will also make their return continuing their work. The interior art will be done by artist Josh Burcham, while the story is written by Jesse Wittenrich. What do you think of this move by the TCC? Who's excited to get their hands on a free comic? Let us know what you think with the discussion link below! Transformers Collector's Club Timelines #9 Announces Free Exclusive Digital Comic! There's even more love for Masterpiece Star Saber now! Via Hobbybase on Facebook, we can share with you these magazine scans. They show off Masterpiece Star Saber's glorious color prototype in all its glory - poseability, gimmicks, accessories, details and more are highlighted here. If you like your Transformers in the classic Japanese super-robot style, this Star Saber is looking to be a fine Masterpiece update of the already excellent original - a Masterpiece that will be to the Japanese Generation 1 what Masterpiece Convoy Version 2 was to the first seasons of the cartoon. Check out the new images attached to this post. We are pleased to announce that Transformers comic book artist Casey Coller will be attending TFcon Chicago 2014. Casey is known to fans for his work providing variant covers for IDW’s Robots In Disguise and More Than Meets the Eye comics as well as many one-shot issues. He will be selling prints and offering commissions to attendees all weekend long. The Transformers Collector's Club tweeted the final official reveal of the Subscription Service 3.0: Generation 2 Starscream! If you need this Seeker to continue your Seeker collection, as well as the other 3.0 offerings, you have just over a week remaining to order. As a reminder the subscription ordering period is open through October 2, 2014. Also teased by the Club was an announcement of an announcement, which based on this tweet from BotCon is related to TFSS 3.0. No further clues were given, but we should know what is to be revealed tomorrow afternoon. Is it the free figure provided for subscribing to the service? We'll find out! Check out the new image after the jump and if interested, head over to the Transformers Collectors Club homepage to find out more and sign up for the third year of the TCC figure subscription service, which will feature in addition to G2 Starscream, Serpent O.R., Carzap with G.B. Blackrock Kreon, Tarantulas, Krok with Gatoraider, and Nacelle. Tomorrow ushers in a new issue of IDW's Robots In Disguise series. If you're just as impatient as most of us are, you can wet your appetite with the full preview of Robots In Disguise Issue 33 courtesy of Comicosity. The solicitation for this issue is below and you can click the title bar to read the full preview yourself. But be warned, spoiler may be ahead! The Transformers Universe website has been updated revealing two new characters into the game: Pandemic and Outsider! The first character revealed is the Autobot, Outsider. The Universe bio page gives more description to the Transformer: "Beaming in and out of battle in the blink of an eye, Outsider utilizes unique teleport abilities to dodge bullets with his tactical ingenuity. Don’t let his 60’s style fool you, this Autobot isn’t as peaceful as he looks." The second character reveal is the Decepticon Pandemic. Again thanks to the Universe bio for providing us with more detail about this Con: "This warrior has a fighting style that is infectious! Taking pleasure in poisoning anyone not blessed with his own sharp style, this snake like Decepticon sinks his fangs into his enemies." Make the jump to discuss the character reveals with fellow TFW2005 boards members! RovioMobile updated their YouTube channel with a brand new Angry Birds: Transformers clip, this time showing off Chuck as Bumblebee. His design is similar to the Live Action Movie Bumblebee/Transformers: Prime Bumblebee but with a G1 head. "Chuck has been transformed from the fastest bird flying into the fastest bot on four wheels! Bumblebee has a knack for getting himself into trouble, but his lightning-fast reflexes, and bravery can get him out of any sticky situation. Of course an overactive trigger finger helps too! Help the Autobirds and Deceptihogs save Piggy Island in a brand new 3D shoot ‘em up adventure, coming to iOS October 15 and Google Play October 30! Check out the official website for more info!" Hat tip to TFW2005 boards member Type-R for providing an in hand scan of Takara's Legends Brainstorm, Swerve and Tailgate from the latest Figure King Magazine. Within the scan we can notice a few differences between the Hasbro and Takara releases of the characters. Brainstorm's deco is darker overall replacing Hasbro's grays with with more black. Swerve features a darker red and his mini-con partner's deco is completely new ditching the Hasbro blue for a predominant white color scheme. Similarly, Tailgate continues the darker color layout with a much darker blue compared to Hasbro's. We'll hopefully be able to see more clearly once these Legends figures are scanned in high-res or in hand reviews are available. For now, check out the new images after the jump. Hero Mashers Soundwave and Slug Found at US Retail. TFW member, Worldsgreatest found the next wave of Hero Mashers Battle Upgrade Figures Slug and Soundwave at a Target in Hanover, PA. Slug comes with Snarl's Tail and Soundwaves comes with Sideswipe's arm. Very exciting news today, member Arduous found Generation Deluxe Class Wave 4 at his local Walmart in Springfield, Missouri. This wave includes the highly anticipated "Fan Built Bot" Windblade who is 30th "Thrilling 30" figure. Nightbeat, a redeco of last year's Generations Bumblebee with a new head sculpt. Crosscut, a redeco of Generations Skids sorting a new head sculpt. Lastly in the wave is Jhiaxus which is a remold of Generations Armada Starscream. The Protectobots multipacks have now been found at retail in Asia. These releases - which we suspect might be Asia exclusive - have been found at a Toys R Us in Sunway Pyramid, Malaysia. The five Protectobots are represented across the two multipacks, using a variety of older molds. The Evac Squad set features Hot Spot and Blades, with repainted from United Artfire (which combined the Classics Grapple crane with the Inferno body) and Blades repainted from Revenge of the Fallen Blazemaster. The Emergency Response set repurposes Transformers Prime Ratchet as First Aid, Beast Hunters Prowl as Streetwise / Streetsmart and the Cyberverse Legion Arcee as Groove. A big thanks goes to TFW2005 member Wildstrikes for the news tip. New Jersey Collectors Con is proud to announce the November 9th 2014 NJCC Mega Door Prize "MTCM-03 Quantron Box Set"! The mighty Quantron stands 28CM/11" tall in combined mode and features five-members where each member can transform into a Sci-Fi style vehicle. Action Figure Expo will be giving away door prizes all day at the September 28th event. The fourth door prize announcement is a set of Transformers GO Samurai Squad figures thanks to show sponsor Madhaus Collectibles. Check out the Madhaus Collectibles booth at the show or online for a great selection of Japanese and 3rd party Transformers. The 11th Annual Canadian Action Figure Expo features special guest GIJoe creator Mr. Larry Hama who will be signing and meeting with the attendees as day long, September 28th, 2014 at the Delta Meadowvale Hotel and Conference Centre – 6750 Mississauga Road, Mississauga, Ontario. Amazon has put up a pair of listings for two new IDW Transformers trade paperbacks. The first of these, due March 3 2015, is the expected collected edition for Transformers: Primacy - the third Flint Dille penned miniseries telling the tale of the early years of the war on Cybertron, the first two issues of which are available now.